Mele Kalikimaka Men's Hawaiian Christmas shirt is available in Red in small only. If you own an original "Made in Hawaii" Diamond Head or Paradise Found shirt you own a piece of paradise! Available-Selections-In-Stock: Christmas Red - Small = 1 in stockWHEN MAKING YOUR SELECTION: It's always agood idea to choose an alternate print or color justin case the item has become Temporarily Out of Stockor has Sold Out. This will prevent delays, refundsand partial shipments. You can choose youralternate/s by using our (Special Instructions Box)located below the area where you enter your emailaddress while checking out.YOUR SELECTION CHOICES ARE IMPORTANT TO US:We will NEVER substitute a purchase with analternate without your approval.SALES UPDATES: Are posted daily. And all listingsare subject to prior sale. 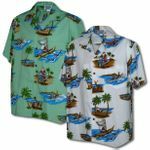 Detailed inventoryinformation can be found by clicking on the link(Available Selections Information) located on thebottom area of any page throughout MauiShirts.com.Mahalo.